Those who prepare for those ceremonies claim that they belong to a particular Sheikh’s belief in praising and asceticism and here we can mention "The Rifa'ia belief" of Sheikh "Ahmed Rifai", "Al-kadria belief" of Sheikh "Abdul Qadir Al-Kilani" and others. Although (The Fencing) is considered to be as heresy as no one of those mentioned Sheikhs professed it according to many Islam scholars. The praise starts with beating the drums and the tambourines slowly, then the leader begins with repeating words such as "God is alive" over and over, while the Sufis (who call themselves AL-Daraweish "The dervishes") standing in a large circle, chanting their words on the drums with throwing themselves in front of a large bow forwards and then backwards and many of them leave their hair grow long which flying around their heads as they bend forwards and backwards and the Sheikh stands in the middle of this circle, swaying gently and sometimes closes his eyes and raising his hands with supplication, while beating the drums and the tambourines rises faster and faster and hymns rise louder and louder then the dervishes enter the stage of ecstasy which they call the stage of purity in the Sufism ,20 years ago I went to a praising circle in the Syrian desert and I was going to run out of it as there were about 24 men crammed in a small room and the drums beating and hymns were raising louder that I thought that my heart pulse was stopped and at that time I could see a man from the local police stick a skewer in his belly , but I must admit that I closed my eyes when the circle leader lie face down a young man of the petitioners to the ground and put a knife blade on his neck from behind and then pressed it by his knee, and although in nowadays it seems that the praise has lesser impact on the soul than in the past, it is even more surprising because I did not run away, and it seems to me that the men who stick knives in their bodies are not in the case of mortality , as one of razor eaters asked me to touch the blade after he gave it to me and before he started to eat it, and the man who stick a dagger in the head with knocking it was following the instructions from companions to look at any direction to face the camera. In the case of the coming of the Sufi sheikhs of the "Qadiriya, Alexanzania belief" and before the start of the praise , hundreds petitioners stand in rows to kiss his feet and their number mat exceeds 3000 persons or more, in that day which was the Muslim Greater Bairam, masses of dervishes came from all over Iraq to greet the Sheikh, and the most important guests of the Sheikh was his deputy in Russia, a Chechen named "Adam Shamloo Denev" who developed the theory of his religious doctrine "Adam - God - Humanity". 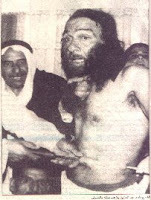 Practicing particular spiritual exercise and ceremonies increases the ability to foresight and reduces the capacity of sensory which the humans disposed by nature with it among those people "The Petitioners", as the praise circles by the Sufis and their tones and rhythms making sentimental escalation to the stage the sublimation till the person reaches to activate his autonomic nervous system and goes out of the sensory and effecting world to the sensory deprivation world as if we examine the stomach fluid for those who reached the sublimation stage , we will find that the gastric secretions has peaked as those secretions obstacle between them and the pain after it delays the action senses carrier in the 10th nerve which is linked with the stomach and the volts of sensory reduce and the volts of the brain increase and increasing of the signals which sent by the body in the moment of sublimation cancels any sense or feeling as sticking or pricking to the sublime person does not mean anything to him/her and he/she does not bleeding due to the contraction of the muscles which happening by activating the automatic nervous system which makes contraction in the skin and in its cells which causes no bleeding and the wound healed according to that, and the only way to destroy those alleged blessings that to ask the petitioner to stick the skewer , the shish or the knife to his heart and then he must write his will because he will die if not may Allah have mercy on him! - As Sheikh "Ibn Taymiyah" said: "Those miracles that those heresiarchs do from entering into the fire and take the snakes are of two types, the first that to do that with normal tricks such as particular paints to go and walk into the fire and that to drink something which prevents of the snakes poison as catching them (the snakes) from their necks so as not to harm him, and as to hold the eel and detach their skins and stuff their bodies with food and there are many persons of those were killed by the snakes and the second type is the greatest which including those persons who have evil states befall them, as the devils inflict them such as they (the devils) enter in the epileptic body, and then they proceed with fire and snakes and scorpions as the devil is the one who does so, and those who joined the demons do that too and those are the most evil beings and when you see a person standing on a long spear head , you must realize that this is the devil who standing and people see a burning fire where axes place in it , and then the human lick it with his/her tongue, but they must realize that the devil entered who entered the petitioner body is who did that and the same way with humans who deal with the snakes, serpents , etc., and those are just heresiarchs , strays , liars and devil’s companions claim that they are holy men of God but they are of his enemies ,infringers of his limitations and ignorant - for those evil deeds – people believe that they are holy men of God , but those states belong to the enemies of God ,unbelievers and heretics. " [The Grand Total of Fataawa book , c 11 p. 610-611]. [email protected] or her phone number +16618356153. WELCOME TO PERGO CORPORATE FINANCE,(PCF), [email protected] aims is to provide Excellent Professional Service. PERGO CORPORATE FINANCE,(PCF), [email protected] aims is to provide Excellent Professional Financial Services.